Our quality products and our concierge level customer care keeps our customers coming back time and time again. Learn more about how we support medical device manufactures. Our competent staff delivers our boutique services through our in-house ISO/IEC-17025 accredited laboratory that upholds the highest standard of quality control. Van der Stähl Scientific’s on staff certified packaging engineer is certified through the IOPP (the Institute of Packaging Professionals). All employees are required to understand quality systems and are CKF certified (Certified Kaizen Facilitators) to better manage the complicated process of medical device packaging validation. This assures you will receive competent technical support for the machines we offer. Choose a category below to learn more about why Van der Stähl Scientific is the clear choice for medical device packaging machinery. We offer long lasting, precision controlled equipment designed to meet the challenges of medical device manufactures. Our advanced microprocessors are developed to meet the robust normative requirements for sterile device packaging compliance and are built for years of trouble free service. Stellar support through our staff of highly trained packaging professionals. From our customer service group to our technical and engineering support you will be delighted with our staff. Happy with a specific staff member? This team member will be assigned to you exclusively. Our services are developed with exacting care, from calibrations to empirical medical device pouch performance studies, we go the extra mile. We streamline your vendor supplier requirement as we are an ISO/IEC 17025 accredited calibration and testing laboratory. We offer a wide range of patented medical packaging systems designed to meet FDA and ISO validation requirements. We provide calibration, machinery maintenance and training at your facility from a quality system certified technician. If you are an ISO-13485 company stay compliant with our calibration performed in our accredited ISO-17025 laboratory. Our CPP (certified packaging engineer) has 30 years of experience and can provide installation qualification support. Van der Stähl Scientific offers only the most technologically advanced packaging equipment; microprocessor controlled and designed to meet the rigors of the ISO 11607. But more than just the ability to meet the regulatory requirements for sterile packaging, our machines are built on a robust architecture that assures decades of dependable use. We have had machinery, such as our MS-350, come into our service center operating perfectly, and these sealers have been in production for nearly 20 years. These sealers have literally created several million seals during their long life. We are astonished by how well these machines hold up; machines that are 15 years old perform just as they did the day they were liberated from their corrugated box. Our goal is to also provide machine systems that utilize a minimal amount of mechanical componentry. Fewer parts mean fewer failures. The Van der Stähl Scientific machines that we offer are known throughout the industry as reliable workhorses. We honestly do not know of another machine in our industry with such stellar performance. When you look at the cost of ownership matrix for our machinery the results are nothing short of stunning. Count on durable, long-performing machines from Van der Stähl Scientific. Our machines are designed to be gentle on consumable parts. That means your maintenance staff will have a great experience with our machinery, as the lifecycle of our consumable parts are exceedingly long. Many of our customers report that our sealers only use a fraction of the parts of other machines in-house and that they do very little maintenance on our sealers throughout the year. Our customers also discover that the parts that are needed are simple and inexpensive, such as heating elements and Teflon sheets. Because so few consumable parts are required throughout the year, costs of ownership numbers are impressive. We have heard tales from customers who have owned other machinery that spoke of the constant changing of consumable parts and system breakdowns. We understand that your packaging machinery is the final stop on your way to the customer. Interruptions in the packaging process can cause a loss of productivity. Our philosophy is to offer machinery with a minimal amount of mechanical parts that are gentle on the consumable parts in order to maintain a sensible cost of ownership index. Van der Stähl Scientific offers machinery that is extremely safe and ergonomic. In the case of our impulse sealers such as the MS 350, a micro switch monitors jaw position and will not allow the sealer to go to full pressure or to energize the heating element until the two jaws meet. In over 20 years in North America, we’ve never had any known injury and we demonstrate proudly our safety functions at the national trade shows. Also, with machines such as our MS 350, the sealer function can be actuated in a number of ways – either through the hand switch if it’s more ergonomic for the worker, or with a foot switch. The system can even be put in a semi-automated mode, in this mode of operation the operator is not required by any biomechanical action to activate the sealing jaws. The system timer can be set to automatically invoke the cycle at predetermined increments, this function can also pace workflow. Van der Stähl Scientific has an on staff certified packaging engineer, certified through the IOPP, the Institute of Packaging Professionals. This assures that you have, not only competent technical support regarding the machines we offer, but also an industrial packaging expert that understands the broad landscape of packaging. All employees are required to understand quality systems and are CKF certified (Certified Kaizen Facilitators) to better understand the complicated process of medical device packaging validation. Having a certified technologist that is completely up to speed on the latest issues surrounding medical device packaging is an incredible benefit to your company. Van der Stähl Scientific works with thousands of engineers doing the very same job as you. We understand the regulatory climate that our machines will be involved in each day. This peer-style support helps to assure that the person at the other end of the phone can provide you valuable insight from the collective brain trust of the sterile device packaging community. Our tech support is available Monday through Friday from 9am to 5pm through our toll free support line (800) 550-3854. When calling, select Option 3 and we’ll get your complicated questions answered quickly. For requests that are not time sensitive, you can also reach us through our contact form. The point is when you call… we answer. Perhaps this is why so many companies have come back again and again to purchase products from Van der Stähl Scientific. It is indeed a unique mix, world-class technological prowess delivered with the warmth of a country store. Van der Stähl Scientific utilizes factory-trained technicians that truly understand every micro-component of the machinery we offer. Many of these skilled technicians not only service your machinery, but some are actually part of the group that creates the technology. We are thorough, well-trained professionals, committed to your satisfaction. It is this woven technological loop that assures the right person will be working on your machinery. Fast turnaround and competent service is the hallmark of Van der Stähl Scientific’s total customer care program. Our service center is staffed with factory-trained technicians that truly understand your machinery. With more than 20 years experience servicing, repairing, and calibrating, our technicians are sure to quickly discover any issue with your machine and quickly repair it and get it back to your facility to get your company back online. Many of our customers have our service department perform their annual “PM” “periodic maintenance.” Our robust, corrugated box that your machine comes in is designed to ship back to our company year after year. One such box has made the trip back and forth for nearly two decades for its annual calibration in its original box. Fill out the Service Request form and ship your machine back to us and we can perform a full service, and if need be, a full calibration in our ISO 17025 accredited laboratory. Fast, reliable, and competent – that’s the mantra of the Van der Stähl Scientific service center. There is nothing more frustrating than to purchase a piece of machinery that will be part of your production loop and then to be waiting weeks for machine parts from your supplier that are not in stock. With Van der Stähl Scientific, other than a few rare exceptions, if you need it we got it. Van der Stähl Scientific stocks thousands of replacement parts and we typically ship the day of the call. We understand that your packaging machine is the final stage of your production and that when packaging machinery goes down; your process has ground to a halt. Lisa Wassberg in our parts department has an incredible knowledge of the machinery that we offer. An autodidactic engineer herself, she can quickly direct you to the part you need to get your packaging line up and running in record time. 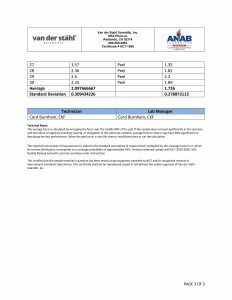 At Van der Stähl Scientific, count on competent parts support. Van der Stähl Scientific is legendary for our ability to ship product in an expedited manner. Over the years we’ve had many customers ask us if they could pay an expedite fee in order to get their product earlier. Sorry, the answer is no. We do not accept expedite fees. We believe quite simply that providing exceptional customer service should not come with a fee. If we have the part in stock and we’re able to calibrate your machine, we’re ready to ship. Just recently we had a customer who has several of our MS 350 medical pouch sealers who had an urgent run and needed a machine right away. Their goal was to get a machine in their cleanroom in a week in order to make up for lost time. They called us at approximately 11 a.m. and by 3 p.m. we had a calibrated machine on our docks, ready to ship to our waiting customer for next day arrival. We keep a solid buffer inventory of all of our popular machines in order to quickly perform for our valued customers. 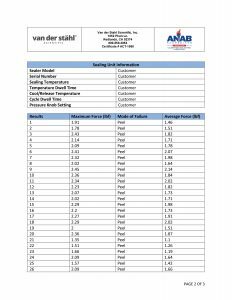 When you need your machine calibrated, count on Van der Stähl Scientific to provide a well-developed N.I.S.T. traceable Calibration from our ISO 17025 accredited laboratory. We can create a high-resolution production mapping on your packaging machine in order to better understand the machine’s functionality and its calibration reliability. After creating calibration sessions we provide you an XY grid histogram, raw line item data, and a separate certification, as well as our N.I.S.T. traceable docs and a calibration sticker on your machine. And as always, you can count on highly trained calibration technicians and fast turnaround. Count on competent calibrations and sensible turnarounds from our ISO 17025 accredited metrology lab. Van der Stähl Scientific employs a Certified Packaging Professional, certified through the Institute of Packaging Professionals. This no-cost service is designed to share our knowledge of critical packaging in order to help our customer’s gain insight on medical device packaging validation. This is available for our medical device customers as well as our general packaging customers. Feel free to contact customer service now and speak with a Certified Packaging Consultant. You’ll receive important feedback on where our industry is trending and how your company can avoid technical issues with sterile device packaging. Van der Stähl Scientific does not just serve sterile device packaging. In many ways Van der Stähl Scientific has guided the direction of sterile device packaging through our own-patented systems such as our force compliance machines that requires operators to perform package testing throughout the day. This is another way we are closing the loop on sterile device packaging compliance. Through frustrations in our own empirical lab Van der Stähl Scientific has created the VIU system. This visual inspection device has created a flat standard in order for a variety of employees to participate in visual inspection of the sterile pouch to avoid the creeping of the sterile packaging process. With our new packaging systems in development, that will vacuum and burst test sterile pouches, we will be forging new paths that will have a ripple effect throughout sterile device packaging. Stay tuned for more exciting new technologies from Van der Stähl Scientific. Van der Stähl Scientific employees are also customers. We buy things just like you do. Our group collectively hates it when we purchase a product and the company seems to have selective amnesia once the sale has been matriculated. Van der Stähl Scientific measures its customers in decades. Our customers come back more because they know they can count on the integrity and reliability of our ethically founded organization. You can count on us following our warranty agreement, in fact, more often than not, we have serviced machines out of warranty at no cost to our customers. If something doesn’t seem right, then you shouldn’t have to pay for it. And you simply won’t. Satisfaction is always guaranteed. If you’re unhappy with the Van der Stähl experience, call the CEO. Just call customer service and tell them to get the president. No employee firewalls between you and the president’s desk. We want to make you happy. Period. Van der Stähl Scientific has gained its reputation not through marketing and gimmicks, but by what we do day in and day out. We subscribe and closely follow a code of ethics. Thank you for the opportunity to serve you. 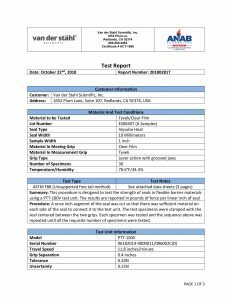 Van der Stähl Scientific has an expansive package integrity lab that allows us to perform a host of tests on your package. We can evaluate your medical device pouch with an ASTM F-88 peel study, visual inspection, dye penetration, etc. Let us know how our empirical lab can work for you to understand the quality of your sterile barrier. When it comes to calibrating your medical pouch sealer, count on the metrology lab at Van der Stähl Scientific. We use the most recent systems and data loggers. All of our calibrations that are performed are done so in our ISO 17025 accredited laboratory. So as you can see, there are many reasons to choose Van der Stähl Scientific. We could go on and on about other parts of our company and other functions that greatly benefit our customers, but we don’t want to brag. Need references from other customers who have benefited from our exceptional machinery and stellar customer service? Contact customer service at 800-550-3854 and we’ll be happy to put you in touch with a current customer so they can share their experiences with you about Van der Stähl Scientific. Of course, we hope to earn your business. Sadly the term “earning your business” has become so generic it has lost all meaning. But when we say we wish to “earn your business” we mean it. We will do the work necessary to get your business; it’s our goal and our passion. Van der Stähl Scientific would be offering an incomplete program if we did not understand the process in which our machines are being sold into. And yet it seems our competition is quick to pass validation questions to a paid consultant. Again, we employ a CPP (Certified Package Professional) certified by the Institute of Package Professionals in order to assure the most competent person can answer your validation questions. Moreover, Van der Stähl Scientific has more than two decades in sterile device packaging validation. We are constantly receiving feedback from the marketplace through FDA inspections and other highly trained validation personnel. This collective brain trust of validation experts provide feedback to your program that is surely unmatched in our industry. When you need solid answers about sterile device packaging, count on Van der Stähl Scientific. Our company founder and president comes from a micro-surgical device manufacturing background and he understands the challenges of medical device packaging compliance. While many packaging machine companies in our industry were born in general packaging, we have always been exclusively a medical device packaging machine provider. We lead with patented, paradigm-shifting innovations like our MS-451 medical pouch sealer that integrates testing and inspection in order to thwart the distribution of failed seals. Our ISO/IEC 17025 accredited laboratory supports each machine we sell with traceable calibrations and pouch testing. Our staff of quality system certified technicians drive our machine service and calibration program. Our on-staff certified packaging team leader, Charlie Webb CPP, offers medical device packaging validation support for your installation qualification.